The thought planning, decorating, cooking, and hosting dinner parties can be intimidating to some, but for Kim, dinner parties couldn’t come often enough. But since we’ve were living and blogging from two different states and visiting each other on weekends, hosting dinner parties weren’t the easiest things to organize. But it just so happened that on the week that Kim moved back to Southern California, POM Wonderful selected us to host a POM Harvest Dinner Party. It was a perfect opportunity to welcome Kim back to California with some friends and host a party. 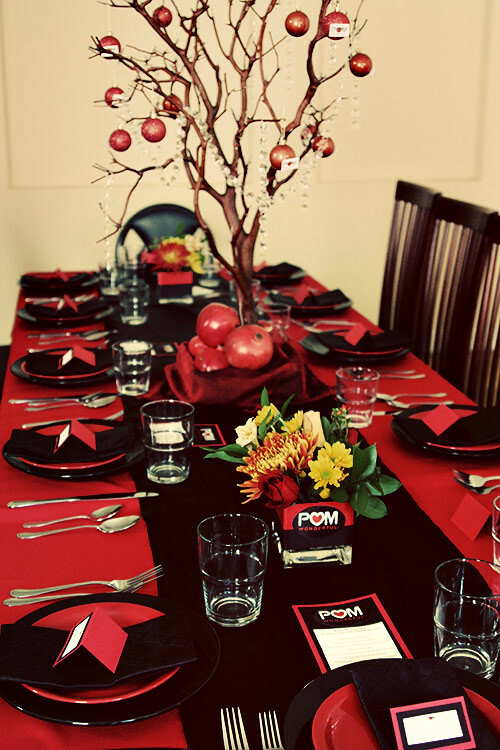 Our theme was a “Red and Black” party and Kim sewed the table cloth and runner to match the red and black plate settings. 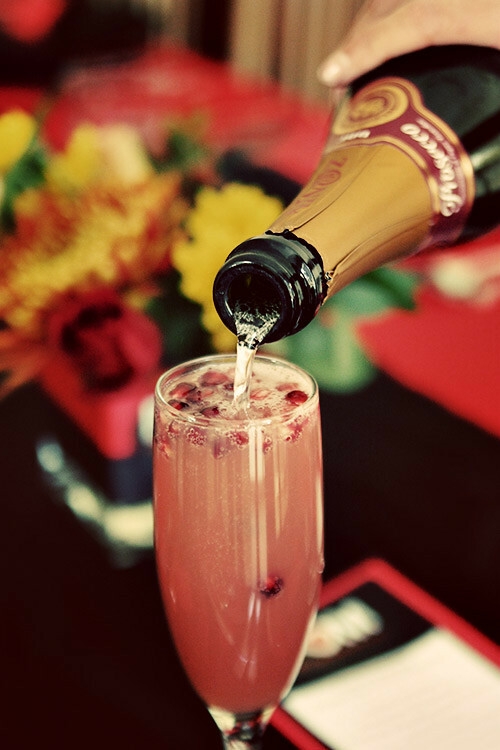 As guests arrived, we started of with some POMosa’s: a lovely concoction of orange juice, pomegranate juice, and bubblies. Here’s a toast to friends and a big welcome back for Kim’s return to California! Cheers! Manzanita tree, sewed table cloths, menu cards, and name tags, she didn’t spare any details! 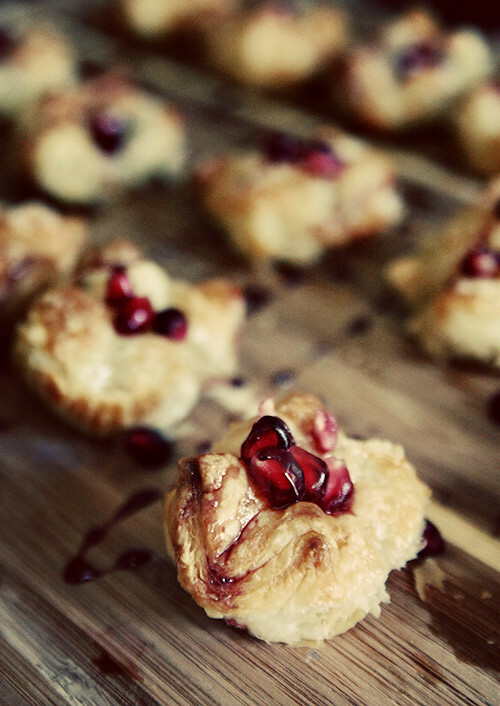 While sipping on POMosas, a platter of crispy puff pastry wrapped around oozing warm brie, pomegranates, and pomegranate reduction were passed around. Finally, when all guests arrived, we sat down to eat. 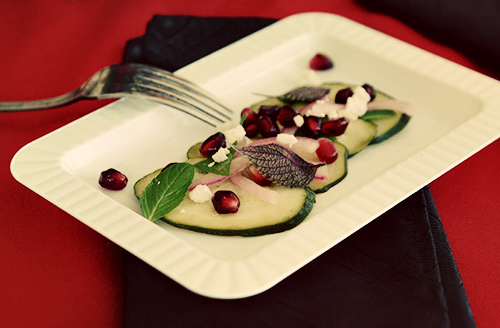 The first appetizer was a refreshing citrus marinated zucchini crudo with pomegranates, shiso, lemon balm, and feta. 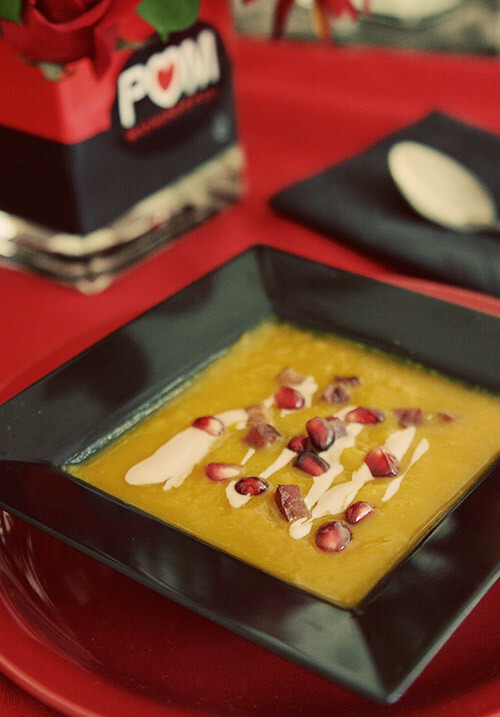 Then came our hearty roasted kobacha squash soup with pomegranate infused creme fraiche, pomegranates and crispy Chinese bacon. 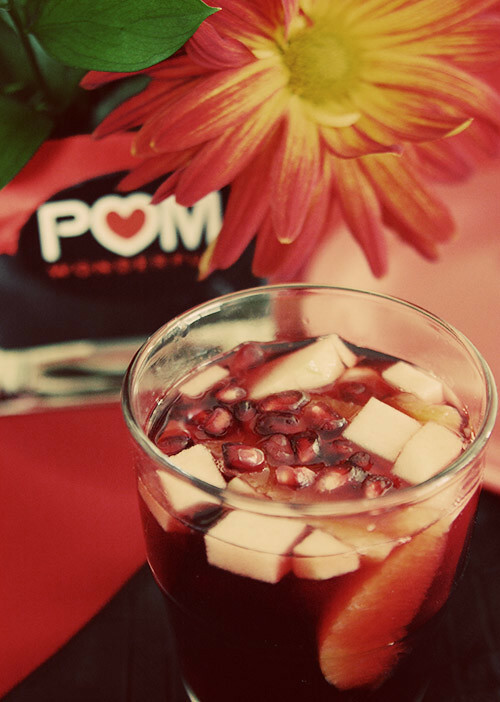 For a festive dinner drink, we also had a POM Sangria with red wine, POM juice, pomegranates, pears, apples, and oranges. 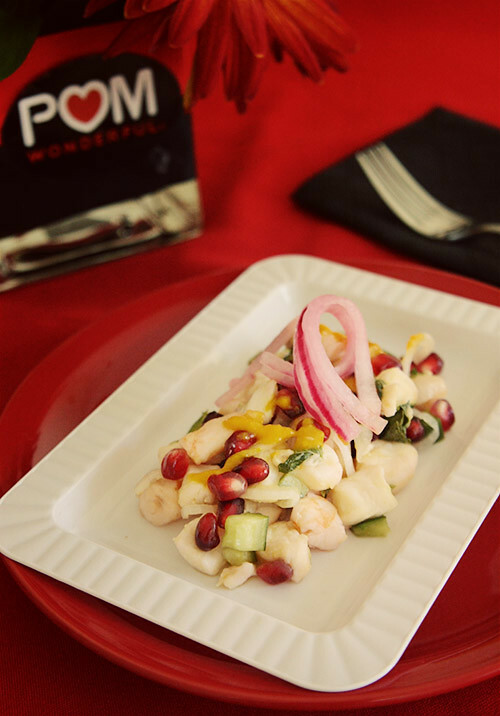 Our fish course consisted of a halibut and shrimp ceviche with pomegranates, Persian cucumbers, pickled red onions and yellow Peruvian aji amarillo chili sauce, a deceptively sweet and spicy chili. 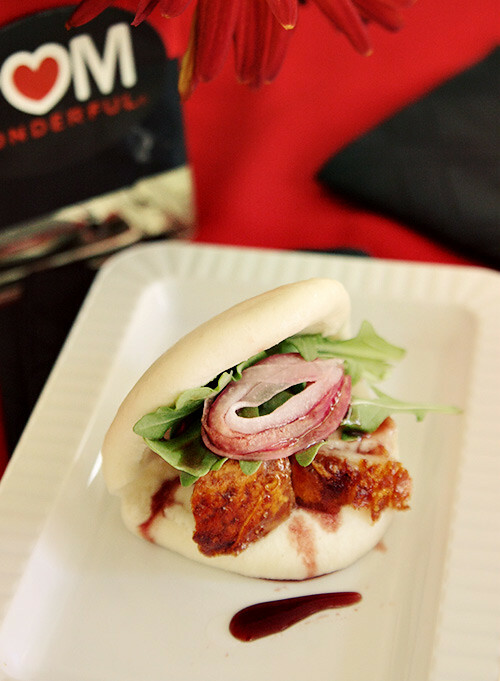 We roasted crispy pork belly as our main and served it in a pillowy soft bao, topped with a pomegranate molasses-hoisin sauce, arugula, and pickled red onions. The sweet and salty pomegranate molasses-hoisin sauce was perfect for the succulent pork belly. Finally for dessert, we enjoyed a warm pomegranate and cinnamon poached persimmon, cored out to serve as a cup for vanilla bean ice cream. The persimmon, pomegranate, and cinnamon reduction sauce was then drizzled on top along with fresh pomegranates. After dessert came the fun festivities! What’s a party without a POM-ñata? 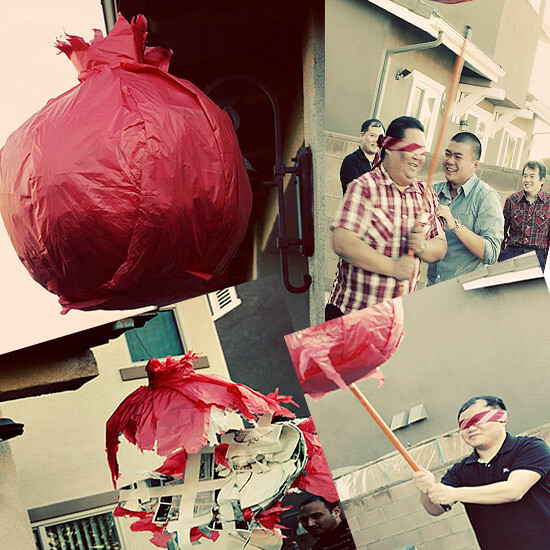 Kim and I made this huge pomegranate POM-ñata and stuffed it with red bags of candy to represent the arils and the POM Wonderful goodie bags for our guests. Luckily there was only one minor injury to our quite embarrassed friend Danny of Kung Food Panda blog. After the mad scramble for goodie bags and red bags of candy spewing from the POM-ñata, we held a best dressed contest to reward the guest with best “Red and Black” outfit. Our dapper friend Remil, won hands down and modeled his well deserved POM Wonderful apron. 1. Cut off the top of the pomegranate just below the crown. 2. With the crown removed, you will see 4-6 sections of the pomegranate divided by white membrane. With the knife’s point, score the skin along each section. 3. 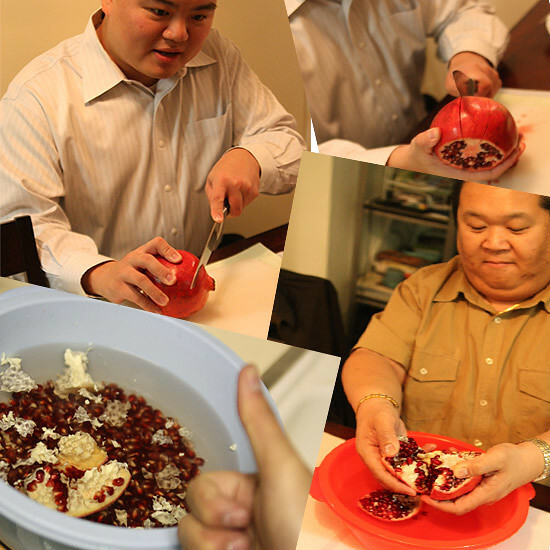 Using both hands, carefully pull the pomegranate apart in a bowl of water, breaking it into small sections and place it in a bowl of water. 4. Loosen the arils and allow them to sink to the bottom of the bowl. The membrane will float to the top. 5. Use a strainer or slotted spoon to scoop out the white membrane that have floated to the top of the water. 6. Pour the arils and remaining liquid through a strainer and enjoy! After the party, each guest stuffed their goodie bags with large ripe pomegranates to take home. 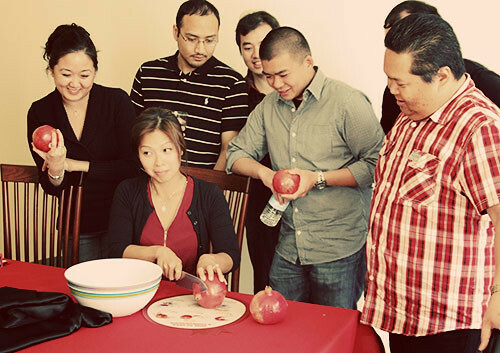 To see if they remembered and learned from Kim’s demonstration, we also asked our guests to send us photos of themselves opening their pomegranates. Great job guys! 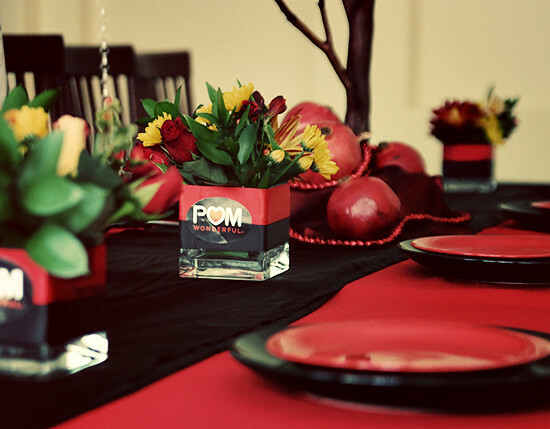 Thank you POM Wonderful for helping us celebrate the POM Harvest and for being a part of Kim’s welcome back party. 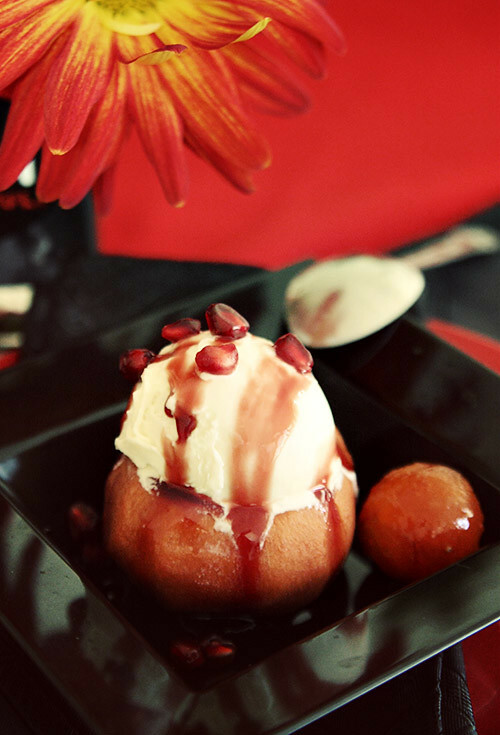 Stay tuned for some of these pomegranate inspired recipes. Wow! You guys really went all out for this POM Wonderful party! 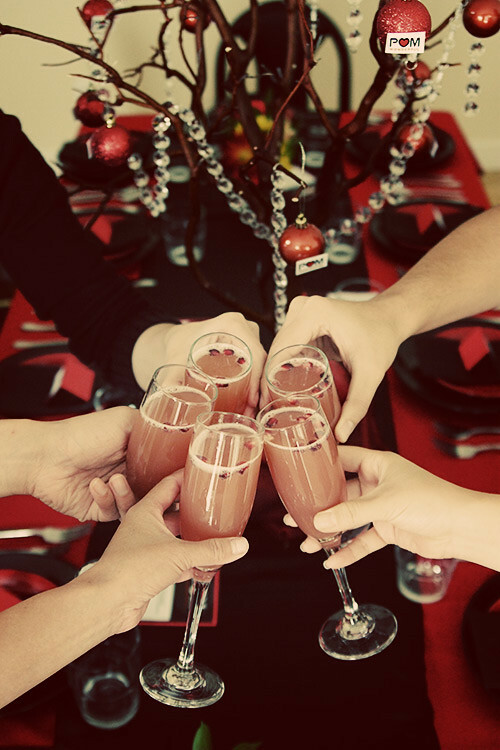 I like how beautiful and festive this party was, the crimson red simply bursts with a holiday touch. I didn't know that POM is the largest grower in the US. I do notice that whenever I purchase a pomegranate with a POM sticker on it, the fruit is more likely to be ripe than from other producers. What a POMpous, POMtastic party this is. 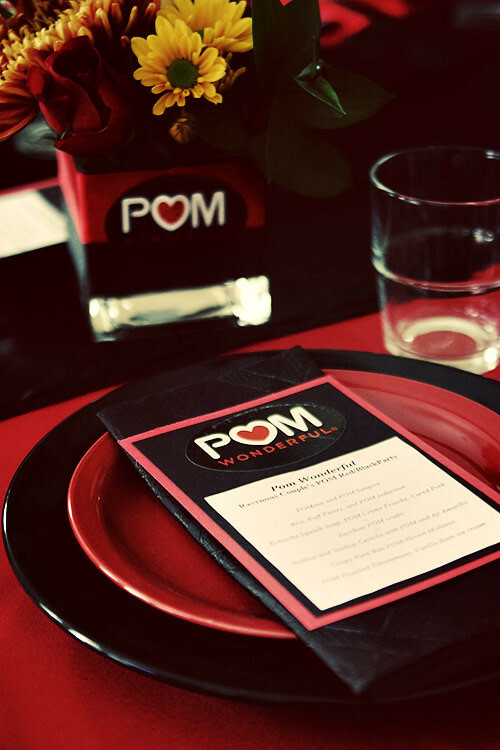 I love the way you POM-erized the party… from the smallest detail and to the food, and the decors.. to the POM-filled fun… and how you POM-oered your guests..Truly POMazing! Beautiful. And wow, a piñata?!! So cool. Wow, what a fabulous dinner party. Yours friends were lucky to attend. 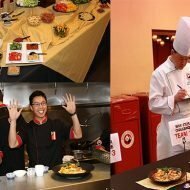 You did a great job integrating pomegranates into all the dishes in a way that made sense. I especially love the POMosas, ceviche, and the POMnata. Thanks for sharing. Everything looks so gorgeous and yummy! Wow! You two did a fabulous job. No detail was omitted and I love eveything. I have manzanitas growing in my yard but I've never thought to use their branches as a centerpiece. Your menu is so inspired, too. I would have enjoyed every bite and sip! Welcome back Kim and fantastic work on all of the decor! The pork belly had me drooling, but that giant pinata was fab! wow i love all the lil details on the decor!! 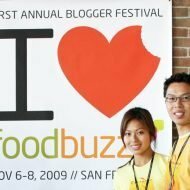 Since meeting you in San Fran I have been dying to go to your blog. Then came my Pom party and some catering gigs. Now I have the time to Say Hi and to tell you that it was a pleasure meting you both. 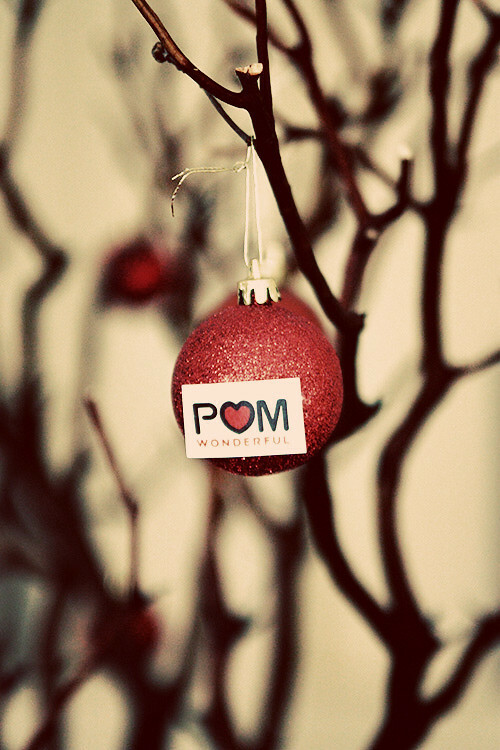 What a great Pomwonderful party you had. I had so much fun with mine. You're party looks amazing. The decorations are so gorgeous and festive. I especially love the tree ornaments. Your pomegranate dishes look great too. 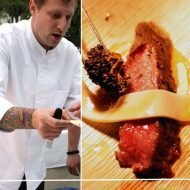 Can't wait to see the recipes. Thank you all for your comments! Wished you all could have been there! Man you guys ROCK! What an impressive spread, Kim did such a great job decorating…if only I could've attended. And the pomnata? FREAKING AWESOME!! LOL . . I LOVE the Pomnata. Soooo funny. How long did it take to make that? Looks like a fantastic party. Late to comment but that was a lot of fun! Great food, company, and free Pom! I cannot believe I missed this wonderful party!